with cover artwork by Robert Lloyd. One hundred years after the sinking of the Titanic, the history of that ship was commemorated in this all new and incredibly comprehensive volume. It is now in its third edition. 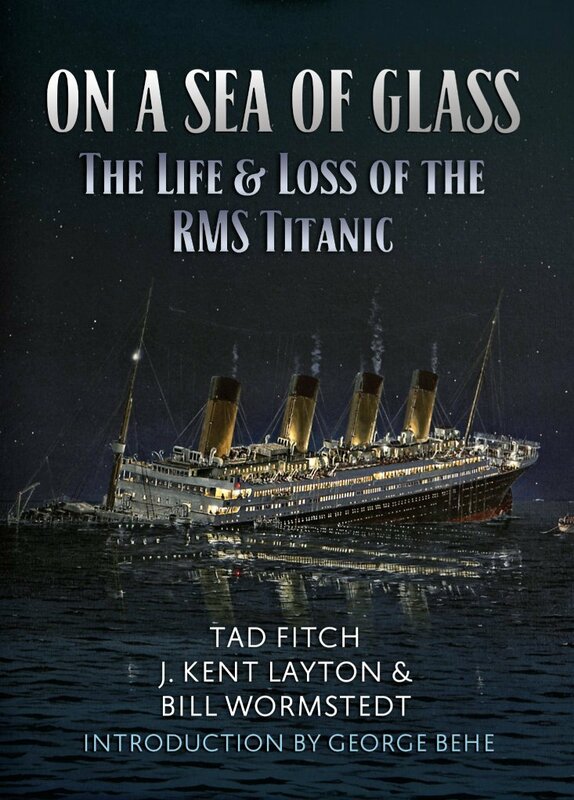 Co-authored with Tad Fitch and Bill Wormstedt, two well-known and highly respected researchers of the disaster, On A Sea of Glass reveals the history of the Titanic as you have never read it before. From the personal stories, to the most accurate timeline of events during the sinking of the ship yet compiled, to the common misconceptions – nothing is beyond this volume’s scope. Did ship’s officers shoot passengers, or did one commit suicide? Was the Titanic switched with her similar sister ship Olympic? Was Titanic‘s construction of a poor nature, contributing to her loss? What became of Captain Smith and Thomas Andrews? How did the ship’s final five minutes play out, and how did she break up, from a technical perspective? Was the ship trying to make New York on Tuesday night rather than Wednesday morning? All of these questions, and many more, are answered within this volume. Finally, a series of comprehensive endnotes provides a scholarly-level of citation back to original source material, and also expands information presented in the text. “A chance to experience Titanic‘s story like never before.” – Shipping Today and Yesterday. “A must have book… a definitive source.” – Mike Poirier, Encyclopedia Titanica, co-author of Into The Danger Zone: Sea Crossings of the First World War. On A Sea of Glass: The Life & Loss of the RMS Titanic was also nominated for the 2012 Mountbatten Maritime Award by the Maritime Foundation in Great Britain. A Limited Signed & Numbered edition has also been made available exclusively through the authors. Click here for more details on this volume.